At the ITB travel show in Berlin last week it was conformed that Germany is now Europe’s largest cruise market and second in the world after the United States. Not only that, but with the addition of the new AIDAprima and Mein Schiff 5 later this year, the number of German cruisers is expected to reach 2 million. Meanwhile, across the seas in Florida, winter will end next week without a single cruise having departed that state for Cuban waters. Eighteen cruises were planned for the 2016 winter season but not one has yet departed. 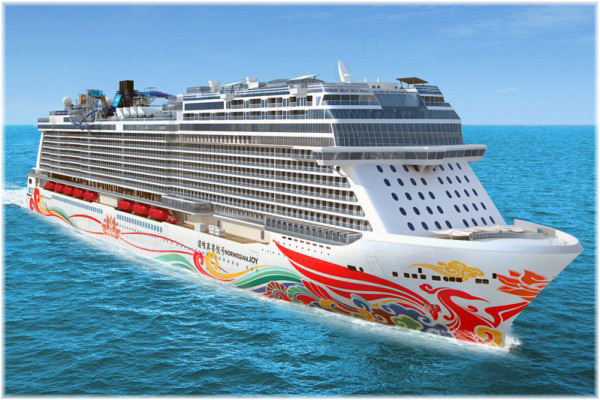 Finally, we have a brief look at Norwegian Cruise Line’s new China ship. It was announced at the travel show ITB in Berlin last week that the number of German cruise tourists had more than tripled since 2005, reaching 1.81 million in 2015. But this year is likely to see the German market exceed 2 million for the first time, confirming its position as the most important cruise market in Europe, with the UK in second position since 2014. But growth in the German market compared to last year was only 2.3%, largely because of constraints in capacity, particularly the serious delays that have been suffered by the 3,250-berth Mitsubishi-built AIDAprima, which is now more than a year late, and sister ship AIDAperla, which is now due to be delivered in Spring 2017. Only one ship was added to the German market in 2014, with TUI Cruises’ 2,534-berth Mein Schiff, while two ships, the 552-berth Deutschland and 550-berth Azores, were transferred to other markets (as it happens, Deutschland will now return in 2016 under a special charter from her new US owners to Phoenix Reisen). 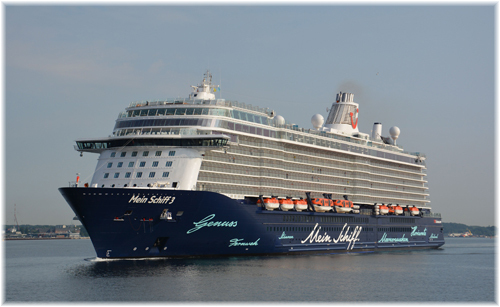 However, growth is expected to resume in 2016 when two new ships, the AIDAprima and Mein Schiff 5, join the market. This should allow for a return to double-digit growth so that Germany can exceed the 2 million mark this year. According to CLIA Germany, the average fare Germans paid on ocean cruises rose 3.3% in 2015 to €1,580 per person. German lines operating 28 German-speaking cruise ships carried two-thirds of the market last year. At 1.23 million travellers, these passengers generated an average fare of €1,709 per person. International operators carried the remainder, just under a third of the market, with their 582,000 German passengers generating an average fare of €1,331, about 15% less on average than on the German ships. 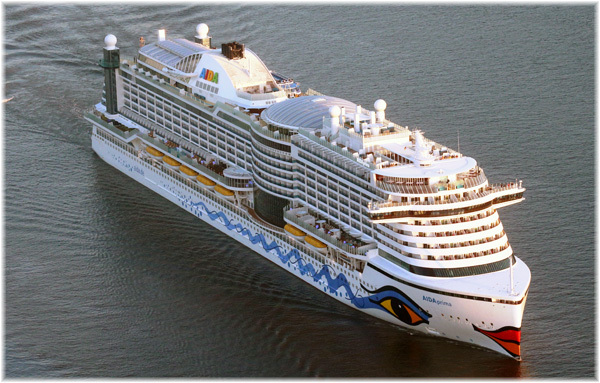 Meanwhile, the long-awaited AIDAprima, the eleventh ship built for Germany’s largest cruise line, Carnival-controlled AIDA Cruises, will be christened in Hamburg on May 7, to climax the Port of Hamburg’s 827th Anniversary. AIDA will be the main sponsor of the port celebration this year. AIDAprima will enter cruise service from Hamburg just the week before, on April 30. 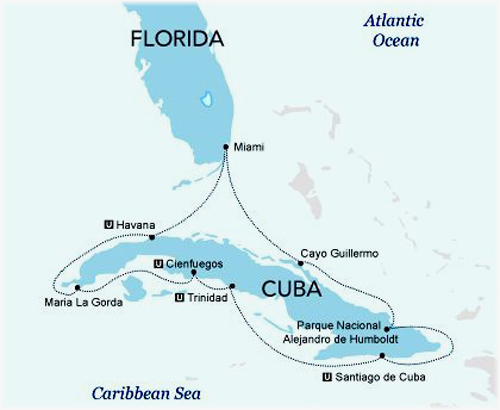 Despite three cruise companies promising to offer Florida-Cuba cruises this winter, not one such cruise has yet taken place to fill the huge gap that has existed in passenger commerce between the United States and Cuba. 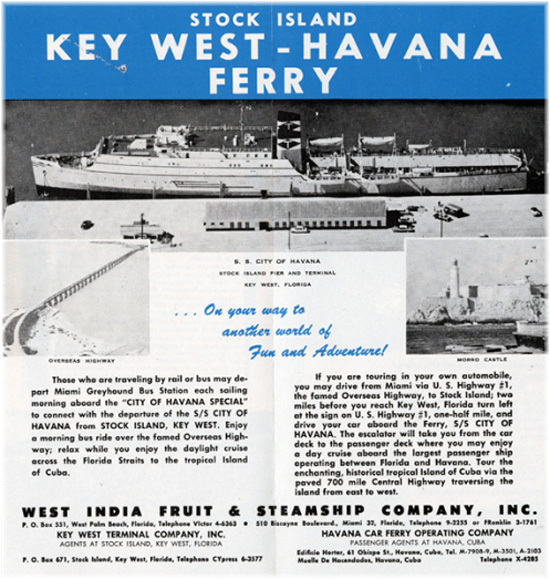 Until the early 1960s, the Peninsular & Occidental Steamship Company’s 400-berth cruise ship Florida sailed three times a week between Miami and Havana, carrying regular cruisers as well as point-to-point passengers. But the last passenger ship to leave Havana for the US, in September 1962, was the Key West-Havana ferry City of Havana. The City of Havana carried 287 passengers, mainly Cubans with US residency certificates and fifty US State Department employees. In the more than half a century since, passenger and cruise ships have not sailed between the United States and Cuba. Last year, three lines, Fathom, Haimark and Pearl Seas, all newcomers, announced that they would be entering the Florida to Cuba cruise market, all with small ships. 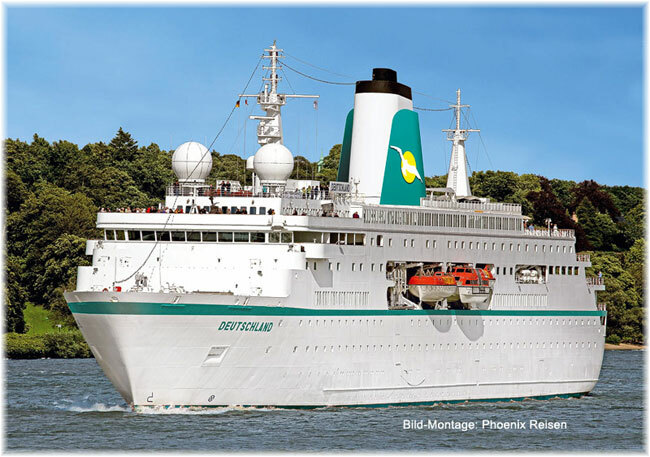 Last month, however, Haimark Line cancelled the first of a highly anticipated series of cruises to Cuba because it is still negotiating the availability of its chartered ship with its owner. The February 29 cruise, to be operated in conjunction with license-holder United Caribbean Lines, would have been the first in half a century to sail from Miami to Cuba. Eight such cruises had been scheduled between January and April 2016 but it now looks as if none of these will be operated. Fares were to have begun at $4,599 per person plus port charges. 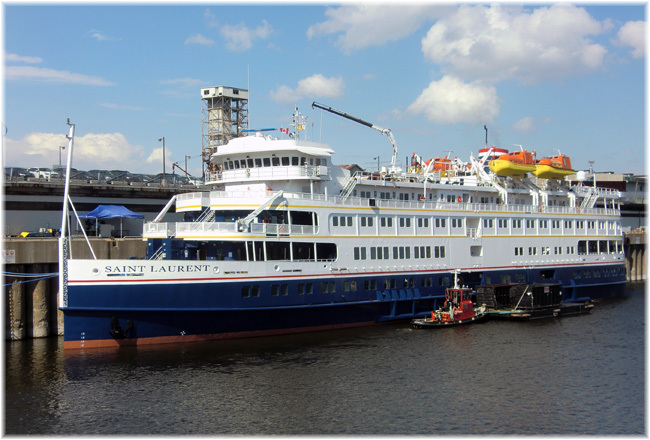 Haimark Line had been planning to offer these 9-night cruises on the 210-berth coastal cruise ship Saint Laurent. But that ship is now the subject of an insurance dispute after the ship collided with a lock in the St Lawrence Seaway last June and eventually lead to the company entering Chapter 11 bankruptcy protection in October. Haimark has since been in talks with the shipowner, Clipper Cruises, in an attempt to free either the Saint Laurent or another vessel in the Clipper fleet for these Cuba departures. As with others that were scheduled, the February 29 cruise would have taken guests round trip from Miami to Havana, Maria la Gorda, Cienfuegos, Trinidad, Santiago de Cuba, Humboldt National Park and Holguin. Meanwhile, competitor Pearl Seas Cruises has more recently had to cancel two 10-night cruises planned for this month between Florida and Cuba in its 210-berth Pearl Mist, but for a different reason. Its March 6 and March 16 departures had to be been cancelled as they did not yet have final permission from the Cuban authorities. The cancellations occurred at very short notice. Pearl Seas Vice President Timothy Beebe told Travel Weekly, “Pearl Seas Cruises received notice on March 10 that the meeting with the Cuban government, where we expected to receive final approval, had been postponed until after President Obama’s visit. Therefore we had to cancel the March 16, 2016, Cuba Cultural Voyage cruise” as well. Most of Pearl Seas’ passengers have transferred to later cruises, but some have cancelled and received full refunds. Pearl Seas has four more Cuba cruises scheduled in March and April, and seven more scheduled in the autumn, starting on October 26. Pearl Seas has been advertising a series of ten 7- and 10-night voyages in the 210-berth Pearl Mist that include an overnight in Havana and calls variously at Maria la Gorda, Santiago de Cuba, Cienfuegos and Holguin. The 7-night cruise starts at $5,465 per person while the 10-night voyages begin at $7,810. Fathom is the remaining operator that has been proposing Florida to Cuba cruises, but its first Cuba departure by the 700-berth Adonia is not scheduled until May. She is presently operating between Florida and the Dominican Republic. Initially, Norwegian Cruise Line’s second Breakaway Plus class cruise ship, after Norwegian Escape, was to have been named Norwegian Bliss. Then when she was allocated to be Norwegian’s first newbuilding in the Chinese market it was announced that the name would be changed. In the event, the new name for this 3,900-berth ship will be Norwegian Joy. She is to be introduced in the summer of 2017. As well, a new Chinese brand has been developed for Norwegian Cruise Line that will only be used in Asia. Although based on the same Meyer Werft platform as the earlier Breakaway and Breakaway Plus ships, the Norwegian Joy has been designed specifically for Chinese travellers, particularly when it comes to food and onboard experiences such as luxury shopping at sea. Spokesmen for Norwegian Cruise Line, not to mention Carnival and Royal Caribbean, maintain that the Chinese cruise market will soon be the second largest in the world, exceeding Germany in numbers taking a cruise, although the average cruise length is expected to be significantly shorter than in Europe or even North America. In addition to its flagship office in Hong Kong, Norwegian Cruise Line Holdings is opening offices in Shanghai and Beijing, which will also market Oceania Cruises and Regent Seven Seas Cruises in China.